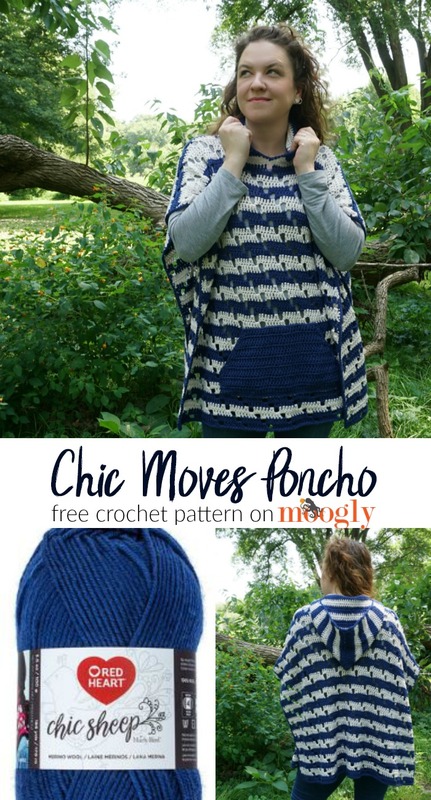 Chic Moves Poncho - Free Crochet Pattern on Moogly! 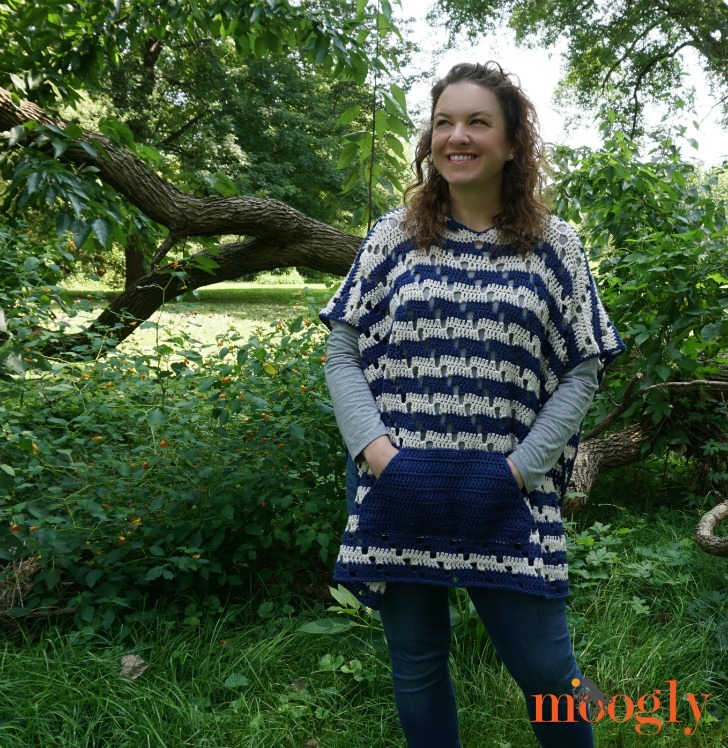 The Chic Moves Poncho features bold stripes, an easy diagonal stitch pattern, pockets and a hood – what more could you want? 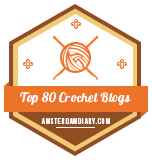 How about this – it’s a free crochet pattern here on Moogly! 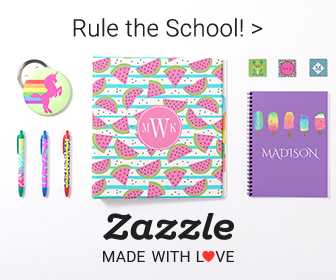 When I was faced with the challenge of creating my own Chic Sheep by Marly Bird pattern, the hardest part was narrowing down all my ideas! But I soon settled on a “one size fits all” poncho. 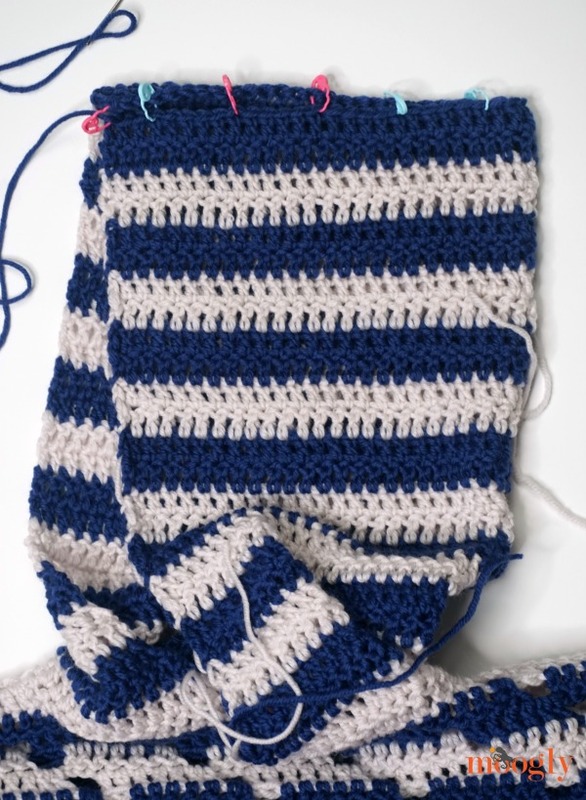 And I had fun combining the horizontal stripes with a diagonal mesh pattern – creating lots of movement in the fabric! The pocket and hood are both optional – but personally, I love them both! 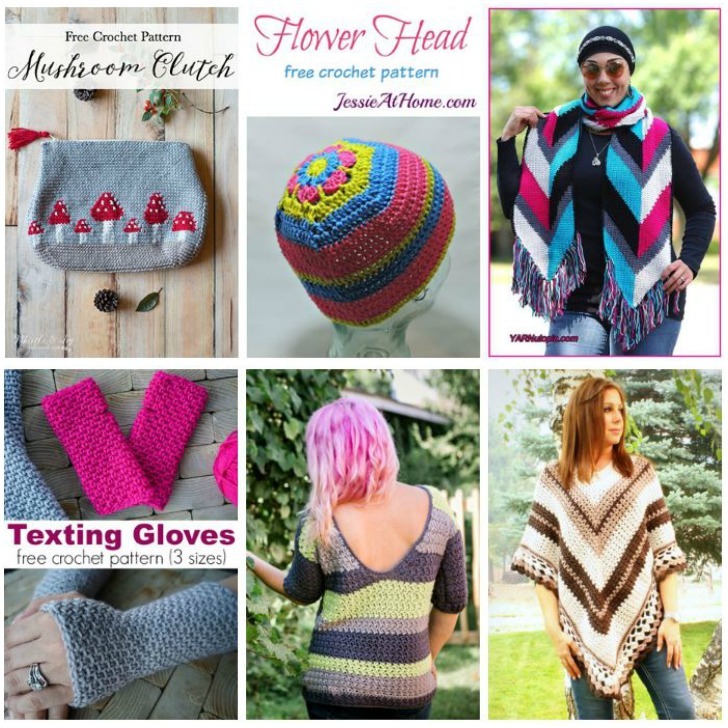 All together they create a cozy warm crochet poncho that’s just fun to wear! 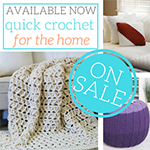 Click the yarn to buy now! 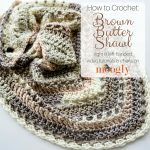 If you prefer a stretchier neckline, work a row of 109 foundation single crochets to replace the chain that begins the Back Piece. For the purposes of this pattern, chains are counted as stitches. When there is a ch-2 sp, dc into it twice, working into the ch sp and not the individual chains. If desired, substitute a Chainless Starting Double Crochet for the “Ch 3 (counts as dc)” at the beginning of most rows. 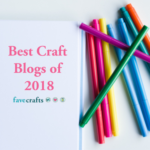 Carry the yarn along the side to avoid having to cut after every stripe and weave in ends – see this tutorial for more on how to carry yarn along the side. The Front is worked into the unused loops of the foundation chain that begins Row 1 of the Back Piece. 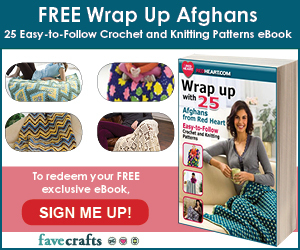 Extra rows can be added in pattern to make it larger. Row 2 (RS): Ch 3 (counts as first dc here and throughout), dc in the next 6 sts, *ch 2, skip 2 sts, dc in the next 7 sts; rep from * until 3 sts rem, ch 2, skip 2 sts, dc in the last st finishing stitch with Color B, turn. Row 3: Ch 3, dc in the next 7 sts, *ch 2, skip 2 sts, dc in the next 7 sts; rep from * until 2 sts rem, ch 1, skip 1 st, dc in the last st, turn. Row 4: Ch 3, dc in the next st, *ch 2, skip 2 sts, dc in the next 7 sts; rep from * until 8 sts rem, ch 2, skip 2 sts, dc in the last 6 sts finishing last st with Color A, turn. Row 5: Ch 3, dc in the next 3 sts, *ch 2, skip 2 sts, dc in the next 7 sts; rep from * until 6 sts rem, ch 2, skip 2 sts, dc in the last 4 sts, turn. Row 6: Ch 3, dc in the next 5 sts, *ch 2, skip 2 sts, dc in the next 7 sts; rep from * until 4 sts rem, ch 2, skip 2 sts, dc in the last 2 sts, finishing last st with Color B, turn. Row 7: Ch 4 (counts as dc and ch 1), skip the next st, dc in the next 7 sts, *ch 2, skip 2 sts, dc in the next 7 sts; rep from * until 1 st rem, dc in the last st, turn. Row 8: Ch 5 (counts as dc and ch 2), skip the next 2 sts, dc in the next 7 sts, *ch 2, skip 2 sts, dc in the next 7 sts; rep from * to end finishing last st with Color A, turn. Row 9: Ch 3, dc in the next 4 sts, *ch 2, skip 2 sts, dc in the next 7 sts; rep from * until 5 sts rem, ch 2, skip 2 sts, dc in the last 3 sts, turn. Row 10: Repeat Row 9, finishing last st with Color B. Row 11: Repeat Row 8, but do not change colors. Row 12: Repeat Row 7, finishing last st with Color A. Row 13: Repeat Row 6, but do not change colors. Row 14: Repeat Row 5, finishing last st with Color B. Row 15: Repeat Row 4, but do not change colors. Row 16: Repeat Row 3, finishing last st with Color A. Row 17: Repeat Row 2, but do not change colors. Row 18: Ch 3, dc in the next 2 sts, *ch 2, skip 2 sts, dc in the next 7 sts; rep from * until 7 sts rem, ch 2, skip 2 sts, dc in the last 5 sts finishing last st with Color B, turn. Row 19: Repeat Row 18, but do not change colors. 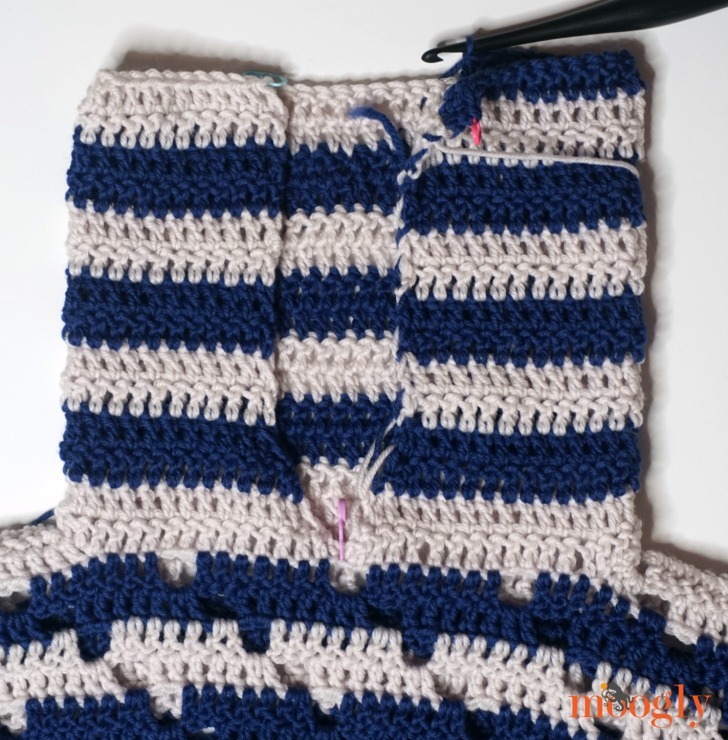 Rows 20 – 44: Repeat Rows 2 – 19, ending on a Row 8 repeat, and changing colors every 2 rows to maintain the stripe pattern; break both Color A and Color B. Rows 3 – 44: Repeat Rows 3 – 44 of Back Piece, break Color A but do not break Color B. Continuing with Color B, turn to work along the side of the poncho, sc evenly around entire piece working a ch-2 at each corner; join and break yarn. If no hood is desired, repeat sc border around the neck opening. Otherwise, continue to hood instructions below. Row 5 – 28: Ch 3, dc in each st across and turn, changing colors every 2 rows to maintain the stripe pattern; after Row 28, break both Colors leaving an 18″ on Color B. Hood Assembly: Fold hood in half so that the first and last stitch meet at the front of the poncho. 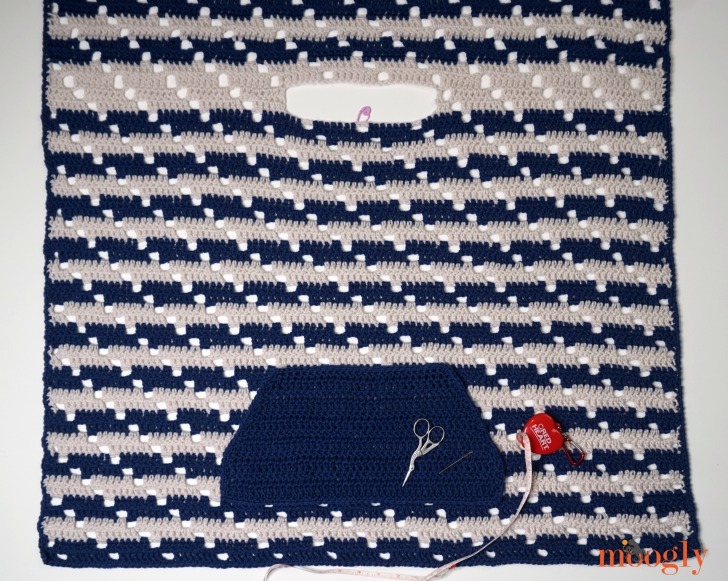 Use the long tail of Color B and the mattress stitch to sew the two halves of this row together and create the top of the hood. Hood Edging: With Color B, join to any st of hood opening and sc evenly around; join and break yarn. Rows 2 and 3: Ch 3, dc in each st across; turn. Pocket Edging: Ch 1, sc evenly around entire pocket working an extra sc where Row 3 and 4 join (both sides) and a ch 2 at each corner; join and break yarn. 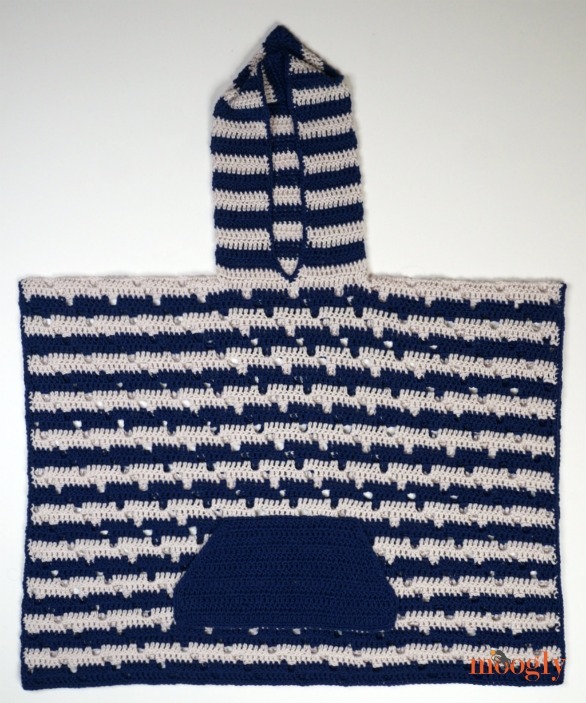 Pocket Assembly: Sew pocket to front RS of poncho at desired height using the backstitch – shown as sewn to Row 26 at the top and Row 38 at the bottom – centered under the neck opening. Be sure not to sew the angled hand openings closed (unsewn portions shown in red on the Schematic above). 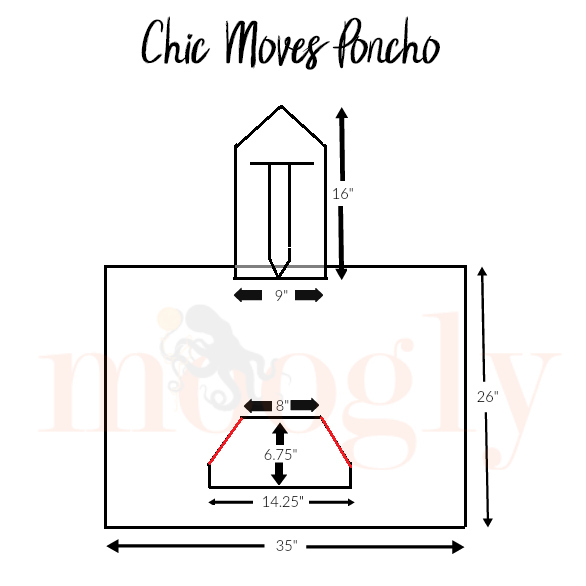 That’s how to make the Chic Moves Poncho! 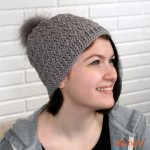 The color and stitch pattern combine to give it a sense of movement, and the hood an pocket add extra coziness. 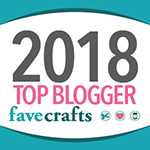 I hope you’ll give this pretty pattern a try! 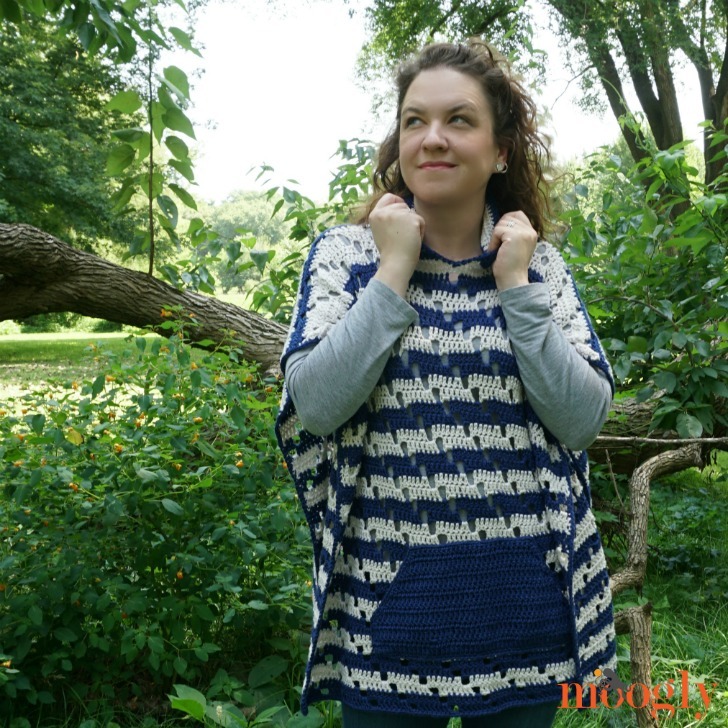 And don’t forget to check out the other gorgeous pattern in the Chic Sheep by Marly Bird Designer Blog Tour! 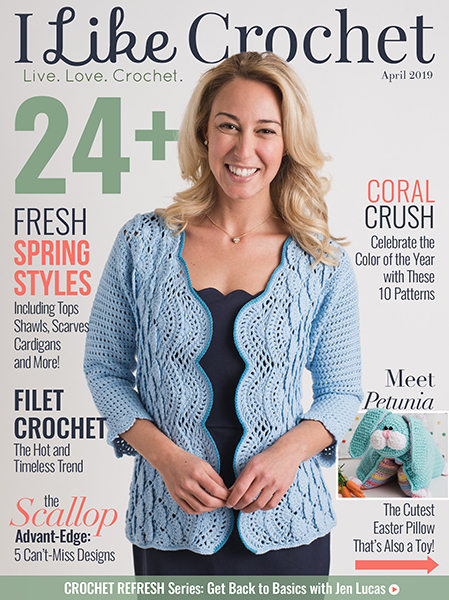 There are a whole bunch of free patterns already out or on their way for this yummy merino yarn. 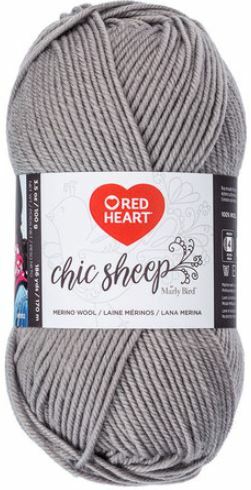 So cute and in y favorite yarn! This ones definitely a keeper! Thank you so much Aida! Any guidance on sizing this down for a 10year old? Frontside 1st row 1st section should say “4 times” or “3 more times”. The pattern as is creates a lopsided neckline. Thank you. 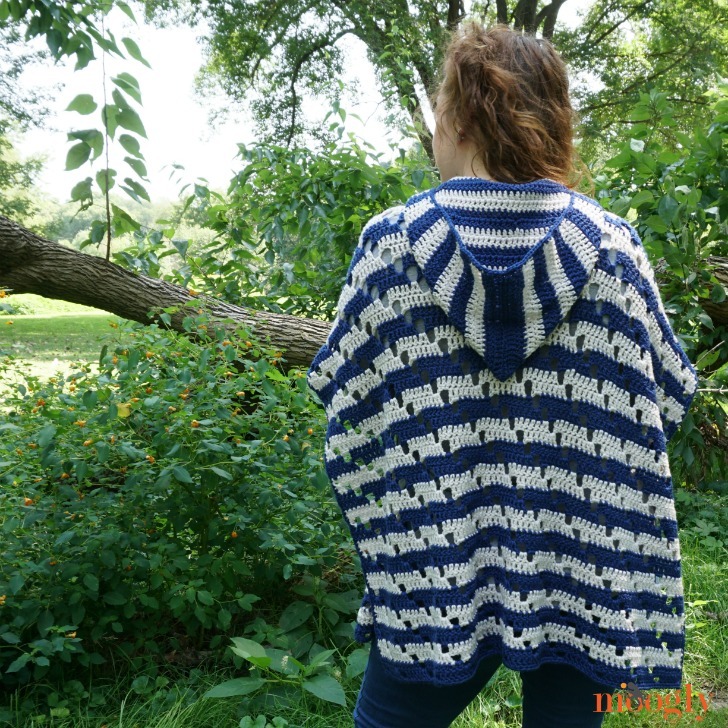 I love this poncho, I am going to try making it. Thank you so much. Thank you Elizabeth! I hope you enjoy it! That will make it even easier too! 😀 You’re very welcome, I hope you enjoy making it! 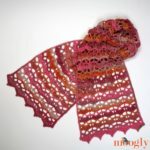 I’m looking at this patern with the idea of expanding the width and making a kitty cat pocket shawl. Are their any pitfalls I need to be aware of before i start running with it? Awesome!!!! I love it and with just a few more stitches I can make it large enough for me!!!! Thank you so much for the wonderful pattern! !